Club SEI's November kit will feature WinterSong. This collection is perfect to enhance your winter or holiday photos and projects. The papers are treated with a warm red flock, glitter and pearl accents. Click here to see what club members can make with this kit. If you aren't a club member, you can still sign-up and receive this kit. This pretty present was made using the November kit leftovers. For instructions on making the pinwheel bow click here or check out JEK's (October's guest blogger) tutorial. 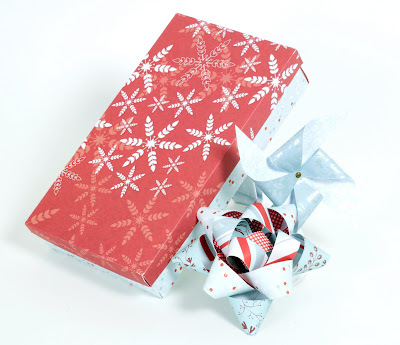 If you would rather make a more traditional gift bow, get the directions here. I'm loving this color combination! I've been super excited about this kit since the first peek. Can't wait for it to get here!